How were your 20’s compared to your 30’s or 30’s compared to your 40’s, … etc? By the time you’ve heard this, I will have turned 40. I can’t help but think back how much more I accomplished in my 30s than my 20s. What blows my mind is what I have planned for the next decade, and I thank you all for listening and following along in my journey. My birthday wish for all of you is to do what you can to build a stable, prosperous portfolio that meets your goals. Maybe one day we can grab a drink somewhere with a warmer climate and share stories, give thanks to our past selves for the hustle we put in so our retired selves could live a little more without worry over money. This podcast also approaches a milestone of 100 episodes. It started with a crazy-nervous host with some odd ball questions, but top notch guests, as an experiment to do six episodes. We were far from perfect, and still are now, but we got it started and the podcast was ranked #55 on iTunes in the investment category. An all Canadian podcast vs the whole wide world of podcasts, and it all started in my bedroom. I still record the majority of episodes from my home office. To celebrate 100 episodes, I have a couple things planned. I’m inviting what I call “centurian investors” on the show to ask them their lessons from owning 100+ properties. What would they do differently so, as usual, we all may learn from their mistakes, their tips and tricks we can apply immediately, and for the long-term for our own portfolios. Even if you’re a beginner, would you want to adopt a centurion investor’s top strategies? A couple quick announcements to make for our upcoming live and in person events. In this world of internet and social media, these tools can not replace networking face to face where you will learn at least one thing to take your business to the next level. March 28th: [iWIN] March Meeting – Off Market Deals, Tiny Houses, Vertical Splits!! Our guest speakers include titans of our industry, Susan White Livermore with over 70+ properties and Ryan Carr who has bought about two houses per month for the last three years. Ryan just sold the Tiny house as well, so let’s find out how the deal went down and how much money he’s counting! For iWIN members, this is included in your Membership. Tickets are available to purchase for non-members, as this is a special event. Russell Westcott, best selling author, expert instructor on the subject of raising capital for real estate investors, is back to take a deeper dive on the subject of joint venturing where YOU, the real estate expert, will learn the expert secrets to attract capital partners for your real estate co-ventures. Getting mortgages is tougher than ever, the ability to raise capital for any business or investment is key to continuing the growth of your portfolio. After countless requests for more networking time, iWIN is hosting a Members-Only dinner. The cost of this dinner is included in your iWIN Membership. There will be structured networking, so expect to be having new conversations with experts you have not met before. Summer iWIN Socials: Mastermind On A Boat, Mastermind on a Bike – Niagara Wineries Bike Tour. On to this week’s show!! In the first panel the diminutive tyrannical King character addressed his subjects from the balcony of his castle and emphasized the need for “peace and harmony”. In the second panel the King continued by stating “We must all live by The Golden Rule”. Traditionally, the golden rule is to do unto others as you would have done onto you. That’s what nice people do. The tyrannical King, the central character to the Wizard of Id, is not nice so you can imagine the confusion by both the reader and the audience before the king. 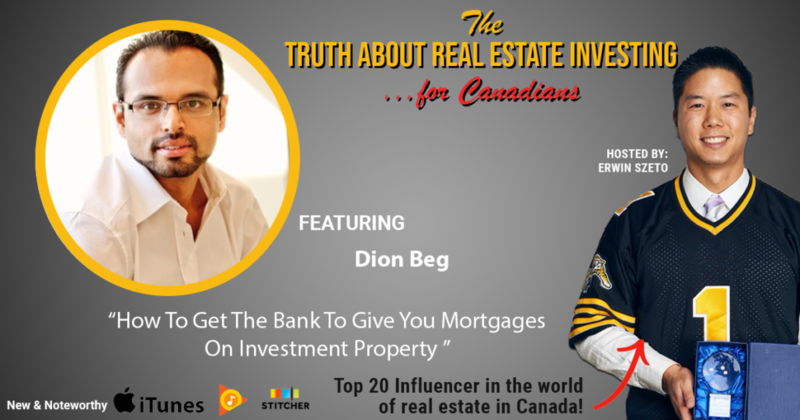 In today’s real world, the banks have all the cheap money, cheap money all us investors want, and on the show we have my old friend Dion Beg who specializes in mortgages for investors. He just so happens to belong to the #1 mortgage company in Canada, Butler Mortgage. I’ve always believed in working with the best of the best, and bringing you the best of the best, hence I asked Dion to give us all an update on the mortgage markets specific to us investors and across multiple investment strategies. Pay special attention near the end when Dion explains the break down of his clientele between recreational, intermediate and advanced. I may have many super-stars on this show, but as Dion shares, you don’t need much to build a healthy retirement nest egg. If you’re new to investing, start there. Because no one else is going to give you a pension for this little effort. Without further ado, I give you Dion Beg. If you enjoyed the show and would like to learn more about investing in real estate then you do not want to miss my Top 10 Tips On Real Estate. It’s FREE to Download!! I’ve interviewed many of the leading authorities in real estate, including Best Selling Authors like Julie Broad, Don R Campbell, Russell Westcott, and Tom Karadza. My super star investors include folks who acquire two properties per month or have transacted on over 100 properties. I have learned a thing or two in my own investing and distilled it down to 10, you-can-not-ignore, tips if you want to be a successful investor.